holding a Celebration of the Feast of Fursey in Norwich on the Saturday nearest his feast day 16th January. For details of our next Celebration click here. inviting scholars to give The Fursey Lectures at the January celebration. Our aim is to publish these lectures as Fursey Occasional Papers for greater dissemination of their content. For details of those published to date click here. holding an annual pilgrimage to Burgh Castle, in honour of St Fursey, on the first Saturday of October. For details of our next Pilgrimage click here. For details of the Preachers at our previous Pilgrimages click here. researching the life of Fursey whose legacy remains to be more fully appreciated. supporting work to further develop an understanding of Fursey's life and mission. To this end we raised the funding for the following Fursey Primary Sources. In 2007, the translation and publishing of the earliest surviving 8th century MS (Harley 5041) of the Life of Fursey which was originally written in the 7th century as 'Transitus Beati Fursei'. In 2014, the publication of Nobilitate vigens Furseus, the Medieval Office of St. Fursey which was the subject of our 2011 Fursey Lecture. visits and pilgrimages to places associated with Fursey. 2017 Unfortunately the lecture this year had to be cancelled at short notice due to unforeseen circumstances. 2016 (twelfth lecture): "Fursey and his brothers: their contribution to the Irish legacy on the continent" by Professor Ian Wood. Prof. Wood has been Professor of Early Medieval History at Leeds University since 1995, having been a lecturer there since 1976. In recent times he has given the Jarrow Lecture 'The Most Holy Abbot Ceolfrid' (1995), the Brixworth Lecture 'The Priest, the Temple and the Moon' (2008) and the Friends of Lastingham Church Annual Lecture 'Lastingham and its sacred landscapes' (2009). 2015 (eleventh lecture): "Angels and the Otherworld Journey: the Contribution of Transitus Beati Fursei" by Dr Gudrun Warren. Gudrun is leader of the Fursey Pilgrims and the Librarian at Norwich Cathedral. She did her doctorate on angels in the medieval world. 2014 (tenth lecture): "Beyond human knowledge: visualizing individual spiritual endeavour and experience in the art of the early 20th century Celtic Revival" by Dr Nicola Gordon Bowe from the National College of Art & Design in Dublin. She has written and lectured widely on late 19th & early 20th century art and design, the revival of stained glass as an art form, vernacularism and national romanticism and contemporary craft expression. Dr Nicola came to us as an acknowledged expert on the Celtic Revival in Ireland in the late 19th century and early 20th century, a revival that found a visual expression in the Arts and Crafts Movement. With Dr Nicola's agreement we will not be publishing this lecture which was so visually based. 2013: We had to cancel this year's Celebration gathering because of the unavoidable absence of our lecturer and the worsening weather at that time,. Our lecturer was to be Dr Nicola Gordon Brown and we were delighted that she was able to accept our invitation to give her lecture as part of our January 2014 Celebration above. 2012 (ninth lecture): "Fursey’s Irish Origins: Munster, Connacht or Ulster? ", by Professor Pádraig Ó Riain. Professor Pádraig is a prominent Irish Celtic scholar, and his research interests include hagiography, onomastics, Irish manuscripts and the Irish martyrological tradition. For almost 30 years he held the Chair of Early and Medieval Irish at University College Cork, and still remains very active in Celtic studies and research. 2012 marks the 1,380 anniversary of the arrival of St Fursey as the first named known missionary in East Anglia and the lecture explored the start of Fursey’s life in Ireland. 2011 (eigth lecture): "O Fursee pastor aime, o lucerna renitens: the Medieval Office of St Fursey", by Dr Ann Buckley of Trinity College, Dublin and was on the recently discovered manuscript (MS944) containing a medieval Office for St Fursey. The Office is based on the Vita Secunda, an 11th/12th century Life of Fursey. This Life is attributed to Serlo and Robert, two monks of Argenteuil, who wrote it at the request of Arnoul, Abbot of Lagny (d.1106). The original manuscript (MS 944) is in the Bibliotheque de l'Arsenal in Paris. Dr Buckley's lecture was illustrated with several extracts sung by members of the Norwich Cathedral Choir. Dr Buckley's lecture, was published in early 2014 as part of our second Fursey Primary Source Nobilitate Vigens Furseus. 2010 (seventh lecture): "The Front Line: Early Christian Eastern England", by Professor Michelle P. Brown. With Professor Michelle's agreement we will not be publishing this lecture which was so visually based. Instead we recomend her book ' How Christianity Came to Britain and Ireland' which gives full information on this whole subject area; the book was re-issued in Paperback as 'Pagans and Priests: The Coming of Christianity to Britain and Ireland'. As a result of her visiting us on this occasion Michelle was also invited to preach the next day in Norwich Cathedral at the 10.30am Sung Eucharist. Her Address is available to read here. 2009 (sixth lecture): "Beyond Bede: The History and Archaeology of the East Anglian Missions", by Dr Richard Hoggett (Publications Officer for NAU Archaeology). This lecture continued our exploration of early Christianity of East Anglia. 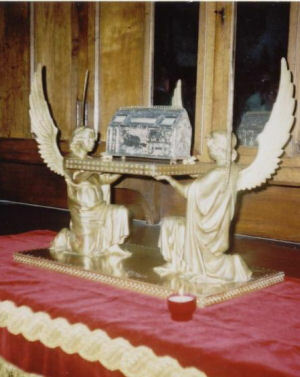 2005 (third lecture): "The Vision of St. Fursey and the development of Purgatory", by Dr Marilyn Dunn (University of Glasgow). The following day was St. Fursey's Feast Day and Fursey Pilgrim the Revd Canon David Abraham was invited to preach on him in Norwich Cathedral at the 10.30am Sung Eucharist. The Address is available to read here. 2018: The Revd Rosie Bunn Rector of St Peter & St Paul, Burgh Castle and All Saints, Belton. Her address can be read here. 2017: The Reverend Dr Peter Doll, Canon Librarian of Norwich Cathedral. His address can be read here. 2016: Father Liviu Barbu, Rector of the Parish of St. Philothea the Martyr and the Venerable Bede in Norwich, and the associate priest of St. George Romanian Orthodox Church in London. 2015: The Very Revd Jane Hedges, Dean of Norwich. Her Address can be read here. 2014: Sister Pamela of the Community of All Hallows at Ditchingham in Norfolk. 2013: The Revd Jack Burton, Methodist Minister and Worker-priest. For a brief profile of Jack click here. His sermon can be read here. 2012: The Area Bishop, the Bishop of Thetford, The Rt Revd Alan Winton. His sermon can be read here. During the Service Bishop Alan Dedicated a Pulpit Fall that had been embroidered by Fursey Pilgrim Philippa Sims for use at our Services and Meetings. More about the Fall appears here. For photographs and more informatiom about the event click here. Where sermons are shown as available on our site they are .pdf files and Adobe Reader is required to download them. If you do not have Adobe Reader go to http://www.adobe.com for a free download. A fact-finding visit to France in 2003, was followed by a pilgrimage to northern France in 2004 – In the Footsteps of St. Fursey. The group was based in Peronne, burial place of Fursey, and visited a number of places in the Picardy region where Fursey is recalled, among them the Frohen villages close to the place of his death. The group also visited Lagny-sur-Marne (east of Paris) where Fursey founded his French monastery. We were also privileged to be given access to the Treasury of Amiens Cathedral to view the 14th century Geuschart chasse given in honour of Fursey, and to see relics that they possess. Visits have also been made to various churches in Norfolk and Suffolk that have windows and images of Fursey. This is an ongoing project. More research in both East Anglia and Ireland are planned. In October 2017 we held a joint evening event with The Friends of Julian of Norwich at The Julian Centre in Norwich. This was the start of a two-day Retreat facilitated by Father Brendan Pelphrey, a priest of St. Sophia Greek Orthodox Church in San Antonio, Texas. Both St Fursey and Julian had the experience of near-death. Both saw the flames of eternal judgment, though there were significant differences. Father Brendan raised the question about what Julian may have thought of her local saint Fursey. Julian seems to have emerged from her experience with a very different impression from that of Fursey; or did she? After the Address by Fr Brendan there was a discussion followed by a reflective Office for St. Fursey led by Fursey Pilgrim the Revd Canon David Abraham and derived from our publication 'Nobilitate vigens Furseus' - The Medieval Office of St Fursey. Click here for a transcript of Fr. Brendan's Address, and here for a copy of the Office. In June 2015, in conjunction with the Norwich Centre for Christian Learning, we held a Study Day on 'Celtic Christianity: evangelical simplicity and deep spirituality'. The Revd Dr Ian Bradley from the University of St Andrews led us in considering what we know about the historic roots of Celtic Christianity and how we might constructively apply it to our lives today. Ian Bradly is the author of books including 'Colonies of heaven: Celtic models for today's church' and has also published in his other area of interest – musicals, and Gilbert and Sullivan. The venue was Norwich Cathedral Hostry and the day ended with the opportunity to attend Evensong in the cathedral. In June 2014 at St Mary's Parish Church, Aldeby, Norfolk we held a celebration of St. Fursey with the singing of Vespers by the Choirmen of Norwich Cathedral. The occasion began with an introductory talk by Fursey Pilgrim the Revd David Abraham entitled 'Who was Fursey and Why Aldeby?'. Vespers for celebrating St. Fursey was sung using the medieval Office in the original plainsong close to the church's north transept Saint Fursey Chapel. This is the only known medieval dedication in England to this first missionary to East Anglia. The event marked the official launch of our second Fursey Primary Source 'Nobilitate vigens Furseus' - The Medieval Office of St Fursey that contains the full transcription and translation of the medieval Office of St Fursey along with the music. The Office had been discovered by Dr Ann Buckley while researching liturgical chant in honour of Irish saints throughout medieval Europe. For further information about the event click here. In April 2012 we met at the Parish Church of St. John the Baptist, Felixstowe to celebrate the arrival of Felix and Fursey in East Anglia. The aim of the Meeting was to help us all think afresh about Felix and the joint work that both he and Fursey were able to do as co-founders of East Anglian Christianity. We were delighted to welcome the then Bishop of Dunwich, the Rt Revd Clive Young, to share in an Act of Worship and preach. A Fursey Pilgrim spoke to us on Fursey and we were pleased to also welcome Archpriest Andrew Phillips to speak to us on Felix. For further information about the event click here. In September 2011 we arranged for the singing of 'Vespers for the Feast of Fursey' in Norwich Cathedral. This was on the eve of the anniversary of the Feast of Translation when the Office was sung in 1256 at a translation of the relics of St Fursey at Peronne in the presence of King Louis IX and was its first use in modern times as an act of worship. The Office was discovered by Dr Ann Buckley while researching liturgical chant in honour of Irish saints throughout medieval Europe. For further information about the event click here. Following the success of this event we raised the funds to enable us to publish a transcription and translation along with the music for this 13th century 'Office for Fursey'. For details of the publication click here. The north-transept of St Mary's Parish Church, Aldeby, is a chapel dedicated to St. Fursey. The Fursey Pilgrim's interest in this led to the recent discovery of a Will dated 1494 that contains the earliest known reference to this dedication. 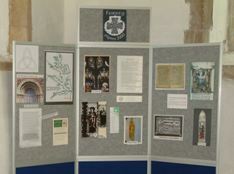 For the May 2009 'Art Alive' event in Norfolk churches, St. Mary's included among their exhibits a Fursey Pilgrims Display along with additional material relating to the Will. A restoration programme for the chapel had been completed earlier in 2009 and the first act of worship there for a decade was held on the Sunday of this weekend. Fursey Pilgrims were among the congregation and one of our number, the Revd Canon David Abraham, preached on the Life of Fursey. We look forward to developing further this link with the St. Mary's congregation. In November 2007 we held a Reception in Granary Court, Bishop's House, Norwich for the launch by the Archbishop of Canterbury Dr Rowen Williams of ‘Transitus Beati Fursei', the first transcription and translation of the earliest surviving copy of the ‘Life' of Fursey. Professor Oliver Rackham, Master of Corpus Christi College Cambridge, had produced a splendid translation for us, coupled with wit and insight both in his Preface and in his footnotes. The Fursey Pilgrims are profoundly grateful to him for responding so readily to our invitation, a dream we had had for some years finally became a reality. The ‘Life' - first written in the 7th century - speaks again in our age with all its original freshness and vitality. To meet Archbishop Rowan was a moving experience for us all. He is such a holy and humble priest, and he spoke to us with insight, humour and encouragement. We are so grateful to the Lord Bishop of Norwich, The Right Reverend Graham James, for hosting the special Reception for us. Bishop Graham has been a consistent friend, encourager and supporter of the Pilgrims. His letter to us afterwards spoke of his pleasure at supporting us because of our ‘corporate commitment to serious scholarship', and of his delight at introducing the Archbishop to St Fursey, and the encouragement it gave to us all. After the Reception we went on to the Forget-me-Not Cafe at St. Michel-at-Plea for a Celebration meal. In September 2007, as part of our 10th Year celebrations and in order to understand more of our Celtic Spirituality Heritage, we organised an inspiring Day Workshop led by the Revd Brendan O'Malley, Canon of St. David's Cathedral, Chaplain and Lecturer in Liturgy at the University of Wales, Lampeter. Under the title 'Lord of Creation: Celtic Christianity for today's world', the Revd Brendan helped us to see how the rich resources left to us by the early Christians in these islands can be understood and used today. Launch by the then Archbishop of Canterbury, Dr. Rowan Williams, of the book ‘Transitus Beati Fursei: a translation of an 8th century manuscript Life of St Fursey'. This event was hosted by the Bishop of Norwich, The Rt Revd Graham James. The display was used by the Fursey Pilgrims to show the Archbishop and the many guests the scope of their interest in the life and times of St Fursey. For more information on this event click here. 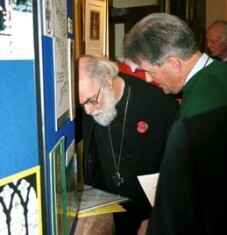 Our picture shows Fursey Pilgrim Tony Sims talking to the Archbishop about the Display. 2009 Art Alive event in Norfolk churches. Included among the St. Mary's exhibits for the weekend was the Fursey Pilgrims Display along with additional material relating to a recently discovered 1494 Will. For more information click here.